Last year I made this 35 ½” x 35 ½” table centre piece. As Easter is approaching fast, I thought it would be fun to publish this pattern. I made my table topper using Angela Yosten’s Flat Collection for Moda but it could be made in pastels or bright, spring prints, reflective of the season. While I used a fabric pen to draw faces on my bunnies, I have included instructions for embroidery. The digital pattern can be found in my Craftsy Store or in my little e-shop. Lots of room in the centre to practice your free motion quilting skills. If you make Flat Bunnies, please add #FlatBunnies tag to your social media posts. I love to see what everyone is making. Jane I love this its adorable.!!! These are sooo very cute! I had the pleasure to meet Angela Yosten when I was at Market last year. When I found out that Angela was releasing her first collection – Flats – I just had to ask Angela if she would send me some off cuts to make a small project to showcase the fabrics. Not only did I receive a parcel of scraps but two of Angela’s fabulous patterns and these amazing perspex ‘pointy’ and pressing tool set. 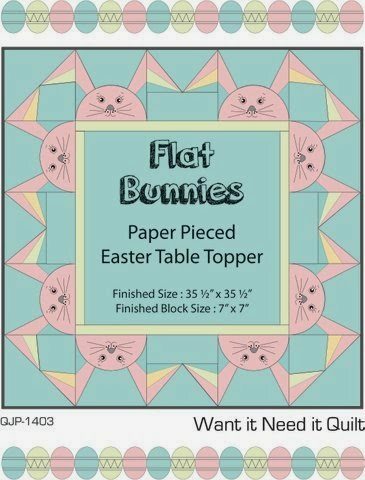 Easter was approaching so I decided to combine the Flat off cuts with whatever was in my stash and create a bunny themed table topper, which is based on a pattern I designed back in 2011. 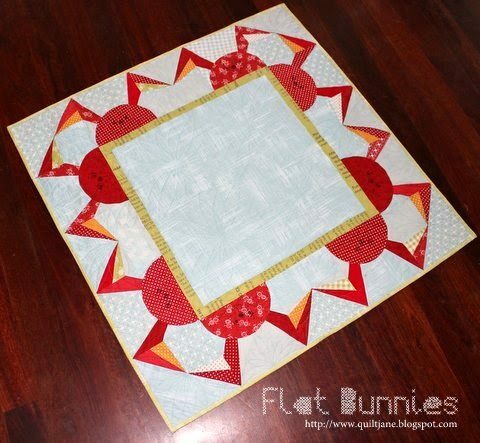 The bunny border is a paper pieced (foundation pieced) using three 7″ blocks to make the corner and border pattern. I even used the instruction panel to make a feature border in the centre. I drew bunny faces rather than embroider to keep the project subtle and ‘flat’. 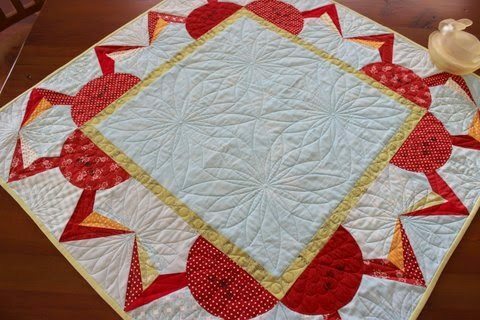 The topper was quilted with Aurifil 50wt cotton thread in 2805, 2265 and 2886 using a combination of digital patterns. Aurifil has even produced a Flats cotton thread box filled with gorgeous cotton threads to match the collection. So cute! I love those bunnies! Very cute Jane! I love the Flats range and will have to get some when it comes out! What a cute topper! You did an awesome job, lovely quilting as well. Thanks for sharing. This is a very cute pattern…..love the colors. Love the bunnies! What a great topper! Love Love Love it!!! Thank you Jane for the feature! You are awesome!! !